This is Booper several years ago, keeping track of everything, in a photo taken by me. He will be 18 in mid-June. Handsome kitty! Tuxies always look so elegant with their black and white markings. Enlarged avatar picture of Pretty Girl, photo by DH. Cats and I are all very excited now that we've done it, though. Oh thanks for sharing! They are such beautiful kitties! I love Bud's whiskers. Each kitty looks very lovable. Thank you for sharing these beautiful kitty photos catwoods. My Rikers would like a date with Booper. Wonderful kitties....finally, we get to see your furkids, Catwoods. 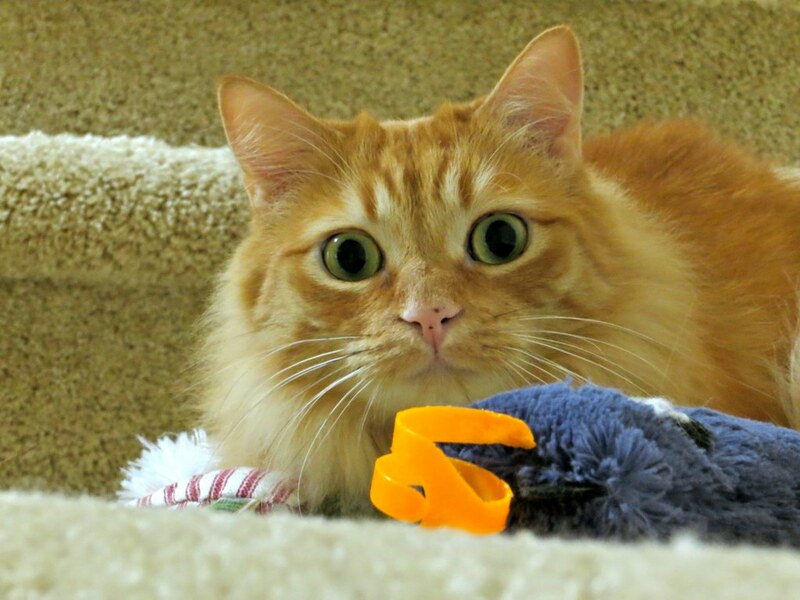 I'm so happy to see the pictures of your fur family, catwoods! Thanks to you and DH for taking the time and effort to post them. Pretty Girl looks much more seductive in the enlarged photo than in the tiny avatar. And if the color on my screen is true, her eyes in that picture are similar in color to my Kalahari, who is also a tabby. Bud does look quite big! Linley sends high-fives to Booper. Tux solidarity! They are beautiful catwoods ! I love Bud's nose stripe too. If I ever get the hang of the new camera I'll get some pix on here to. Beautiful cats! Great photos (even though it drove you nutso to get them up). I have this thing for tigers, so loved seeing your tiger guys. Course, I have this thing for torties and calicos and tuxies and . . . but I've always had at least one tiger. I've thought about updating my photos but they all look like they did last time. That's one thing about "mature" cats - they usually don't look much different as they age. Nice to see you family and great to hear you have a senior cat that is doing well! These babies remind me of my mom's fuzzy kids, only your tigers don't look like they'd want to take my eyes out. Thank you so much, everyone. My cats are very pleased with themselves, having finally made it to the Internet! And they love your comments! Fizzy, Bud is indeed a whiskery boy! Catbird, those green eyes get to me every time! The photo is a good match for PG's eye color. 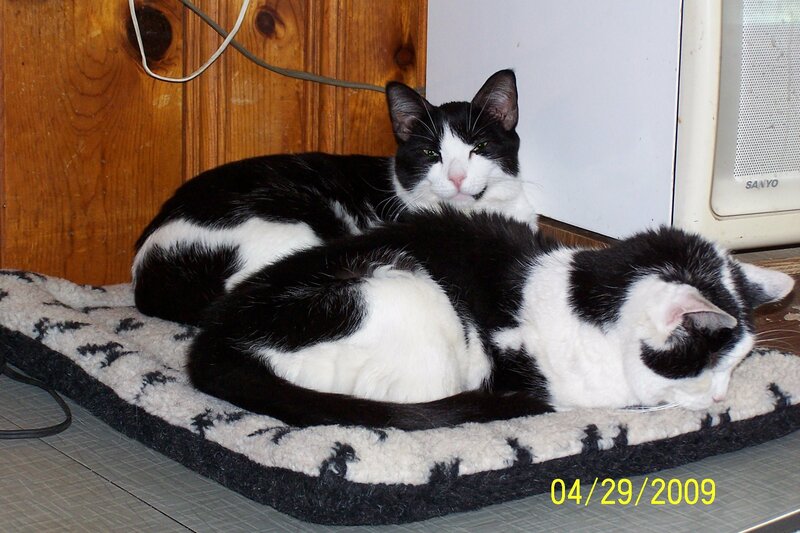 Leslie and Mandycat, it sure has been fun for me to see my own cats here, so it's worth tackling the digital camera, although I don't like them so much myself. They eat batteries. There are too many settings, and then the cat moves. I like to point and snap. Look forward to seeing your pets. Catmom5, I would love to see more photos of your kitties, I'm betting everyone else would, too! So glad you enjoyed the photos, JustMe! Bug, the tiger was a feral and she's now very sweet with us, but she's an alpha girl with the boy cats. Peg, Booper would be honored to take Rikers out. He has meowed of nothing else since he read that. He wants to begin the evening with a sushi dinner and then go on to a Broadway show. He'd like to take Rikers to see "The Lion King".